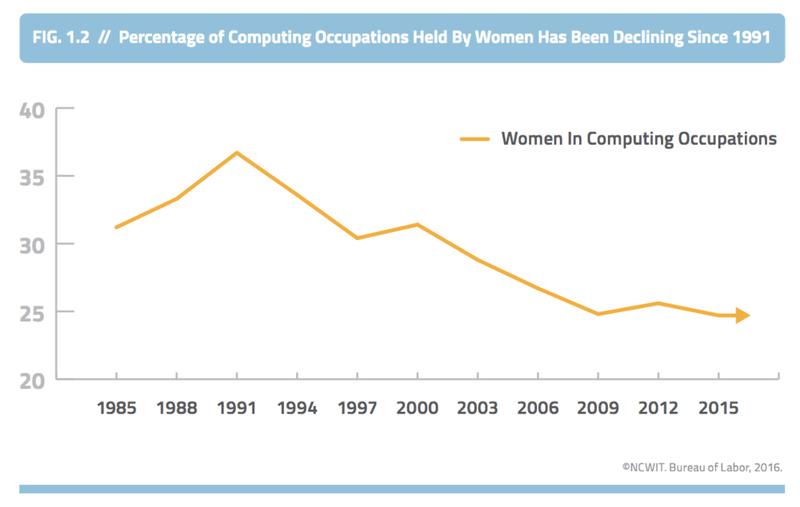 Women hold only 25% of all computing jobs. That needs to change. Currently, 74% of young girls express interest in STEM fields and computer science. As girls grow up, they are deterred from entering the tech industry — an industry that has always been and still is at the forefront of innovation and progress in our ever-changing, inter-connected global society. Our team aims to inspire girls to pursue their tech passions by showing them how awesome the tech industry is, and how much opportunity exists for them in this area. Most importantly, we want to give young girls everywhere an amazing experience that didn't exist for previous generations of women. The rising generation of computer-savvy women starts now, and it starts with educating, empowering, and engaging young girls. This chart was taken from the National Center for Women & Information Technology's 2016 Update Report titled, "Women in Tech: The Facts." The data was compiled by the Bureau of Labor in 2016.